Logilab co-organizes with Octobus, a mini-sprint Mercurial to be held from Thursday 4 to Sunday 7 April in Paris. Logilab will host mercurial mini-sprint in its Paris premises on Thursday 4 and Friday 5 April. Octobus will be communicating very soon the place chosen to sprint during the weekend. To participate to mercurial mini-sprint, please complete the survey by informing your name and which days you will be joining us. This year I attended the FOSDEM in Brussels for the first time. I have been doing free software for more than 20 years, but for some reason, I had never been to FOSDEM. I was pleasantly surprised to see that it was much larger than I thought and that it gathered thousands of people. This is by far the largest free software event I have been to. My congratulations to the organizers and volunteers, since this must be a huge effort to pull off. I went to FOSDEM to present Logilab's latest project, a reboot of CubicWeb to turn it into a web extension to browse the web of data. The recording of the talk, the slides and the video of the demo are online, I hope you enjoy them and get in touch with me if you are to comment or contribute. As usual, the "hallway track" was the most useful for me and there are more sets of slides I read than talks I could attend. I met with Bram, the author of redbaron and we had a long discussion about programming in different languages. I also met with Octobus. We discussed Heptapod, a project to add Mercurial support to Gitlab. Logilab would back such a project with money if it were to become usable and (please) move towards federation (with ActivityPub?) and user queries (with GraphQL?). We also discussed the so-called oxydation of Mercurial, which consists in rewriting some parts in Rust. After a quick search I saw that tools like PyO3 can help writing Python extensions in Rust. Memex, that reuses the name of the very first hypertext system described in the litterature, and tries to implement a decentralized annotation system for the web. It reminded me of Web hypothesis and W3C's annotations recommendation which they say they will be compatible with. Web Components are one of the options to develop user interfaces in the browser. I had a look at the Future of Web Components, which I relate to the work we are doing with the CubicWeb browser (see above) and the work the Virtual Assembly has been doing to implement Transiscope. Pyodide, the scientific python stack compiled to Web Assembly, I try to compare it to using Jupyter notebooks. Chat-over-IMAP another try to rule them all chat protocols. It is right that everyone has more than one email address, that email addresses are more and more used as logins in many web sites and that using these email addresses as instant-messaging / chat addresses would be nice. We will see if it takes off! "Will my refactoring break my code ?" is the question the developer asks himself because he is not sure the tests cover all the cases. He should wonder, because tests that cover all the cases would be costly to write, run and maintain. Hence, most of the time, small decisions are made day after day to test this and not that. After some time, you could consider that in a sense, the implementation has become the specification and the rest of the code expects it not to change. Enters Scientist, by GitHub, that inspired a Python port named Laboratory. Let us assume you want to add a cache to a function that reads data from a database. The function would be named read_from_db , it would take an int as parameter item_id and return a dict with attributes of the items and their values. When you run the above code, calling read_from_db returns its result as usual, but thanks to laboratory, a call to read_from_db_with_cache is made and its execution time and result are compared with the first one. These measurements are logged to a file or sent to your metrics solution for you to compare and study. In other words, things continue to work as usual as you keep the original function, but at the same time you experiment with its candidate replacement to make sure switching will not break or slow things down. I like the idea ! Thank you for Scientist and Laboratory that are both available under the MIT license. At logilab we use more and more docker both for test and production purposes. The resulting image size was about 1.3GB which cause issues while uploading it to registries and with the required disk space on production servers. So I looked how to reduce this image size. What is important to know about Dockerfile is that each operation result in a new docker layer, so removing useless files at the end will not reduce the image size. The first change was to use debian:stretch-slim as base image instead of debian:stretch , this reduced the image size by 18MB. This reduced the image size by 166MB. Then I looked at the content of the image and see a lot of space used in /root/.pip/cache . By default pip build and cache python packages (as wheels), this can be disabled by adding --no-cache to pip install calls. This reduced the image size by 26MB. The idea behind multi-stage builds is be able to build multiple images within a single Dockerfile (only the latest is tagged) and to copy files from one image to another within the same build using COPY --from= (also we can use a base image in the FROM clause). This reduced the image size by 297MB. So the final image size goes from 1.3GB to 300MB which is more suitable to use in a production environment. Unfortunately I didn't find a way to copy packages from a staging image, install it and remove the package in a single docker layer, a possible workaround is to use an intermediate http server. 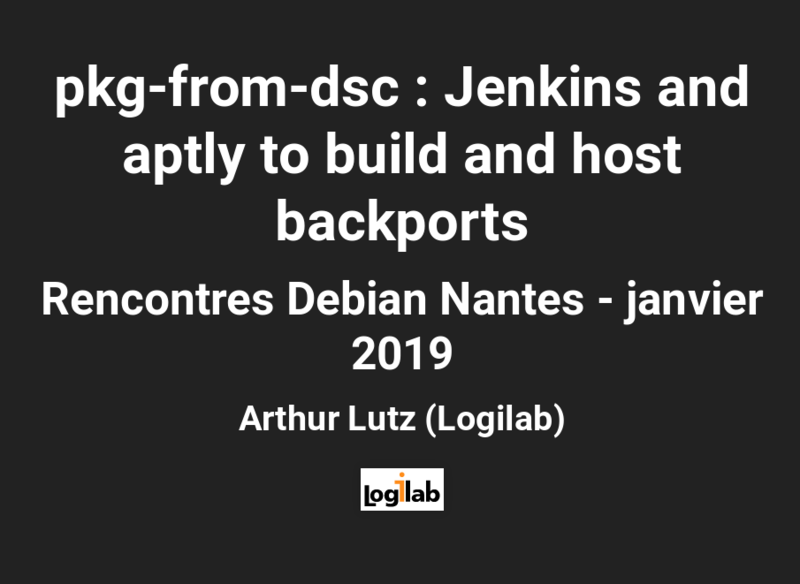 The next step could be to build a Debian package inside a staging image, so the build process would be separated from the Dockerfile and we could provide Debian packages along with the docker image. Another approach could be to use Alpine as base image instead of Debian. La semaine reprend tranquillement après ma participation au 2ème hackathon organisé par la BnF. Tout comme pour le premier, il faut tout d'abord saluer une organisation exemplaire de la BnF et la grande disponibilité de ses membres représentés par l'équipe jaune pour aider l'équipe rouge des participants. Quelqu'un a fait une allusion à une célèbre émission de télévision où le dernier survivant gagne… je ne sais pas dans notre cas si c'est un rouge ou un jaune. Lors de ce hackathon, j'ai eu le plaisir de retrouver certains de mes coéquipiers de l'an dernier et même si nous étions cette année sur des projets différents, je leur ai donné un petit coup de main sur des requêtes SPARQL dans data.bnf.fr. Peut-être que je pourrai demander un T-shirt mi-jaune mi-rouge l'an prochain ? Félicitations à MusiViz qui a remporté l'adhésion du jury ! Je suis pour ma part très heureux des échanges que j'ai eus avec mes coéquipiers et du résultat auquel nous avons abouti. Nous avons plein d'idées pour continuer le projet dont le code se trouve désormais sur http://framagit.org/adimascio/auconcert et un démonstrateur temporaire ici.